Think street art and you’re probably imagining wall murals and graffiti. But one artist in Rome is taking advantage of another city-scape canvas to express his creativity. "It's not easy for me to interact with people in my everyday life. 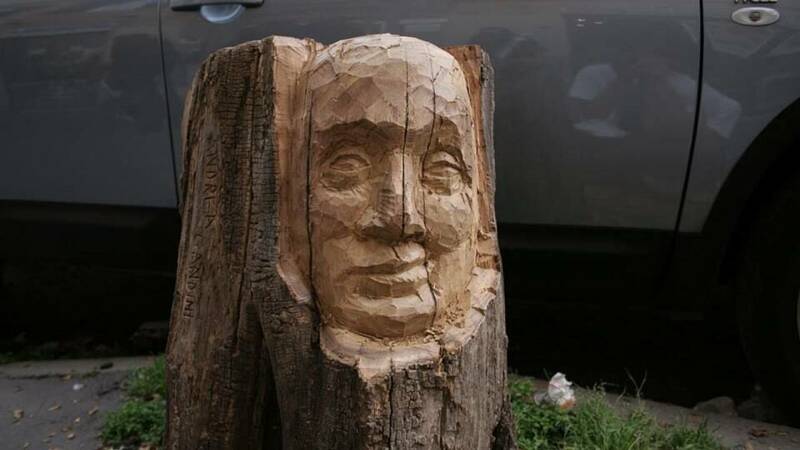 But when I do carving, many different people approach me"
Twenty-year-old "Andrea Gandini":https://www.facebook.com/AndreaGandiniArt/ has a mission to turn tree stumps into art. He began wood carving as a teenager, working from his garage. One day, when he exhausted his stock of materials, he decided to move out into the front garden and take advantage of a tree stump there. “During one day of carving in front of my garage, I met more people than during the whole year of doing it inside my house. That’s why I fell in love with doing it in the streets,” he told Euronews. Andrea usually carves faces on the bases of chainsawed trees he finds along the pavements of Rome’s busy boulevards. However, he's also been inspired to try animals, buildings and other figures. He says he never knows what he will make until he starts carving and gets a feel for the wood. Each work takes a couple of days to complete and Rome is already home to 50 of his creations. Because of his passion for meeting and connecting with passersby, Andrea says he prefers working on busy thoroughfares. “It's not easy for me to interact with people in my everyday life. But when I do carving, many different people approach me, and it is easier for me to communicate while I do what I like,“ he says. Sometimes onlookers, particularly from older generations, will hand over a few euros or buy him a cappuccino and cornetto (typical Italian breakfast). Others just want to take a photo. “Many young people in Italy don’t work and just sit at home doing nothing. Old people see me as their grandson, a grandson who is doing something with his life. They like that about me,” adds Andrea who, in addition to his street art hobby, lives from creating wooden sculptures commissioned by his admirers. So far, the city authorities have shown no interest in the more than 50 carvings he has left by their roadside. “There’s nothing wrong with what I do,” says Andrea. “I just try to give dignity to old trees. They (local communal services) cut the trees and leave them in the streets. I give each tree a new face and a new life,” he adds pointing his finger to a tree stump he just began transforming in a busy street near the Vatican. However, other cities in Sicily, Tuscany and Puglia have recently commissioned some of his wooden sculptures. His goal is to convince his home city to follow. “Rome is the capital city and has a lot of money. Somehow, none of its money is for things like this,“ he adds.